It’s Oliver’s Arkansas debut! 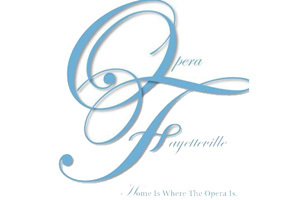 Opera Fayetteville will perform Oliver’s short opera Symposium in its annual Opera in Bloom program, a festival of 10-minute operas. 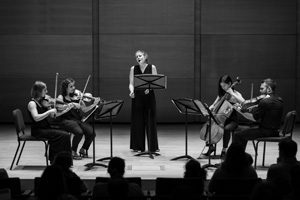 Catch it in pop-up performances around town May 16-24, or at the May 25 grand finale concert at the Botanical Garden of the Ozarks. Symposium (story and libretto by Anne Ray) hovers over a vacant and impersonal landscape of cubicles and hotel conference rooms, following the inner mind of its protagonist as she steps into that familiar and fractured sense of feeling alone, even while surrounded by others. Connecting with other people is so hard – especially when you can’t stop arguing with yourself. Three singers play one woman deciding whether to risk embarrassment for a chance at love. 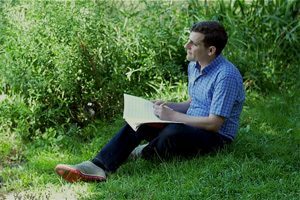 The festival also includes works by Missy Mazzoli, John Greer, Tom Cipullo, Daniela DeMatos, Beth Ratay, Ronnie Reshef and Tony Solitro.